1 - In Neighbor Problems, Billy and Maple are not being good neighbors. Hazel is tearing up the forest floor looking for roots. Sid's leaves start disappearing from his den. What's going on? Has everyone in the forest gone wild? It's time to settle things down and learn how to be good neighbors. 2 - New Adventures with Old Friends: Freddy used to live in the forest and be a wild adventurous fox. He's come back to visit and take some of the young animals on a wild adventure to the frozen lake. New adventures bring new troubles and someone gets lost. 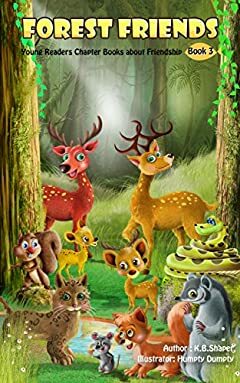 3 - New Friends and Danger: There's a new family in the forest. Hooray! But there's something else new in the forest. An intruder who wants to take over the forest and kick everyone else out. The forest friends need to run and find their extended friends and family from all over yonder to ask them for help. Can they bend together with family and friends to overcome this problem? Parents: Three(3) fun, adventurous stories about friendship - 5-6 chapters/45pages each. Appropriate for your chapter book readers ages 6-8, 8-10, 9-12, depending on their reading abilities. Tags: Early Chapter Books, Chapter Books, ages 6-8, ages 8-10, ages 9-12, forest life, mammals, friendship, adventure, forest, deer, foxes, wolves, coyotes, bobcats, chipmunks, Young Readers Chapter Books, early chapter books, children chapter books, kids chapter books, forest friends, making friends.